“Nullarbor”…”you must be careful”….”crazy”….”how will you carry water?” “Isolation”, “Road trains” references to Wolf Creek and our worst nightmares. 1215km, a distance similar as that of John O’groats to Lands End, ( the length of the UK) the Eyre Highway, across the Nullarbor Plain is an iconic route crossing the largest limestone karst formation in the world with 10 roadhouses breaking the gaps of perceived isolation. Depending upon who you talk to it is flat, never ending, tiresome and boring…..dangerous…..or it is a place of unmarked beauty…perhaps it is a place to find yourself? Well….I wasn’t lost….but perhaps stripped bare, incredibly happy, serene, entertained, entertaining, challenged and we both have come out the other end wanting more. Anyway it is hard to get lost when there is only one sealed road for the entire 1200 plus kilometres. We left the western gateway town, Norseman as the sun shone through a light fog and we wobbled with as much food provisions as we could carry…just carry! We had added at least an additional 10 kilograms to our usual 30 kilograms of kit, food and water. It would be almost 200km to Balladonia, the first roadhouse yet we knew we would get water from a station a short distance off the highway after 100km. Fraser Range is a working station and caravan park with amazing hospitality, the cheapest….but very limited food supplies…in the next 1100km. Limited, but we were able to purchase some baked beans and frozen bread. We rolled into the station early morning and were very keen to stay for the beauty and friendliness and curious but wary glances of the wild emus. We were welcome to make ourselves a cuppa, use the kitchen, despite only passing through. Fortunately we carried so much food as the roadhouses had bugger all, with us sometimes begging fresh food from their kitchens rather than subsist on dry goods alone. And of course the Grey Nomads frequently gifted us with fresh fruit, and even cooked meals and beer and wine. Initially our desire was to make haste…time ticking and a vast distance for this section of our journey, let alone final destination, Sydney. It is not easy for us to make haste on the Nullarbor. It is mesmerising, ever changing, perfect camping, discreet and safe. Moody skies, ablaze at sunrise, sunset, 360 degree views changing by the second, clouds forming, disbanding, chasing shadows. Most nights, sometimes the morning too, we relaxed and found warmth around a camp fire. The first 2 nights the mercury dropped to below zero and our sleeping breath froze to morph our tent into solid panels rather than flowing folding fabric, as we packed up camp. The day temperatures were between 16 and 28 degrees however being plagued by wind day in day out, when off the bikes we were chilly. Head winds were mild and we plodded along. 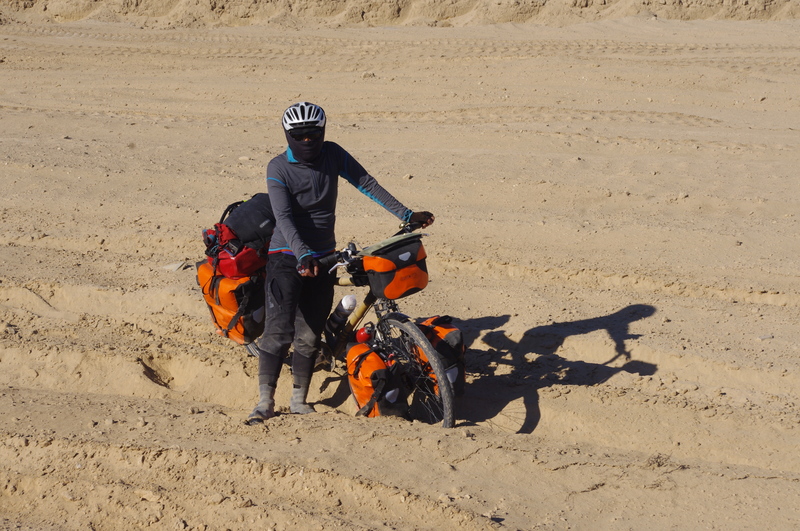 Tail winds…..ferocious, huddled behind any shelter we could find when requiring breaks, yet mammoth 30-40km/hr intervals on a fully loaded tour bike felt epic. Cross winds, much of the time they did not hinder or assist our progress, yet one day as Li was blown into the gravel verge, followed by witnessing a monster road train blown into the verge, we continued on a rutted side track to Nundroo roadhouse where we took refuge, alternating between the restaurant and tent as rain and wind pounded sideways. We waited a day and a half for the weather to become safe enough to ride. Before Nundroo, there was a day when the clouds miraculously disappeared, the sun in all it’s glory, a tail wind directed us 12km off the Highway to the Head of Bight. Southern Right whales….about 30 incredible creatures with calves frolicking in the shelter of a bay, we spent the day captivated at their breaching, tail lollops, spy hopping (google it) and gentle surfacing. Several times we tried to leave before being spell bound once again. All this in view of the Bunda cliffs to the west and post card white sand dunes and beaches to the east. The Bunda cliffs stretch for 200km, as if a monster has taking a whopping bite to create a fantastic coastline that left us constantly in awe. One day we deviated from the highway in search of a cyclists’ log book. Take an unmarked track between kilometre marking x and y until you reach the end of the world, the cliffs and absolute isolation, flat and treeless, howling winds, mist and spray from the crashing waves 90 meters below. Turn left and after 3 kilometres dig up fence post number 3. We dug….no log book, but fulfilled of our wildest fantasies. The salt bush and wild flowers highlighted in all their magnificent as the sun started to dip. We hastily made camp as nature raged about us and the tent our only shelter. I spotted 2 red eyes with my flashlight. Still dark when we rose, the wind was still fierce but a visit by a dingo kept our spirits high….and wary, so that it would not steal our shoes or other possessions as it circled us for around an hour before disappearing at first light. There are tablelands, drastic drops to flat costal plain, old ruins of the first settlers, vandalised emergency telephones, no telephone signal, no internet, dog proof fences, rabbit proof fences, rabbits and road killed dogs. Mostly there are no fences. 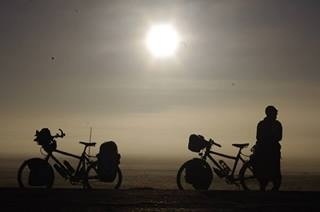 We cycled Australia’s longest straight stretch of road without a bend for 146 kilometres. I was sad as we finally came to our first turn after 2 days of riding. We had hoped to cycle this stretch in a day but did not bother to push as the morning brought a headwind upon us. Everything happens so quickly, the mind wanders for an instance and when you take a look out at the world again, minuscule trees, grass, the lighting, something has again changed momentously, everything is growing larger as the plain becomes more barren for a time. I absolutely love the open roads, long distances and isolation. On the Nullabour I felt absolute peace, no fear, no longing, no missing, I felt exhilarated and alive…and I felt I was on a dance floor, intoxicated, whole, on this open road I found a euphoria that fills me the more frequently I live and continue to ride. 8 Responses to "A long time coming"
Wow! You sound so happy, inspired, rewarded… There’s a strong sense that it’s not all beer and skittles, natch, but I’m loving this post. I would never have imagined cycling across the Nullabor could be enjoyable, and as for the whale detour… glorious. Beautiful writing for a beautiful experience. Pity I couldn’t be there with yous. Gerry. You make me want to do it immediately. I love your writing. Thanks for the update. Look forward to seeing you in Sydney. Great tale of your Nullarbor journey. 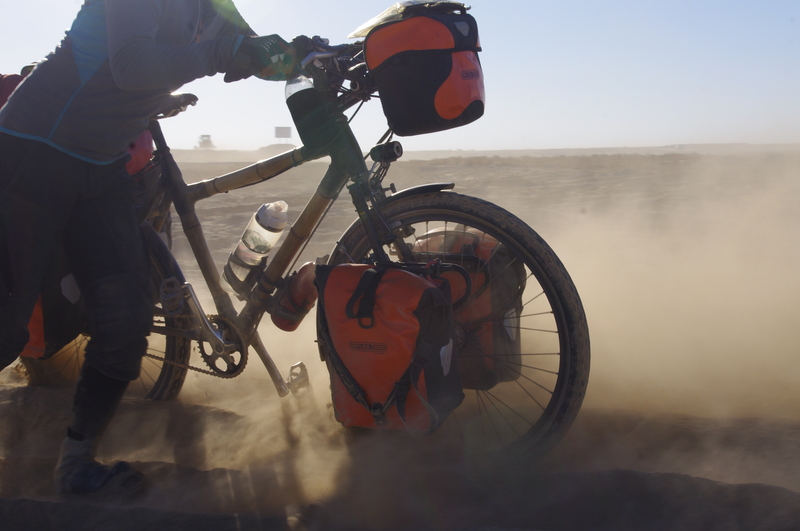 Sounds likje you would love cycling the Oodnadatta Track as well. Lots of wide open and often treeless straight road.